Auckland BJJ is an IBJJF team registered. Our instructor Serge is IBJJF black belt certified. 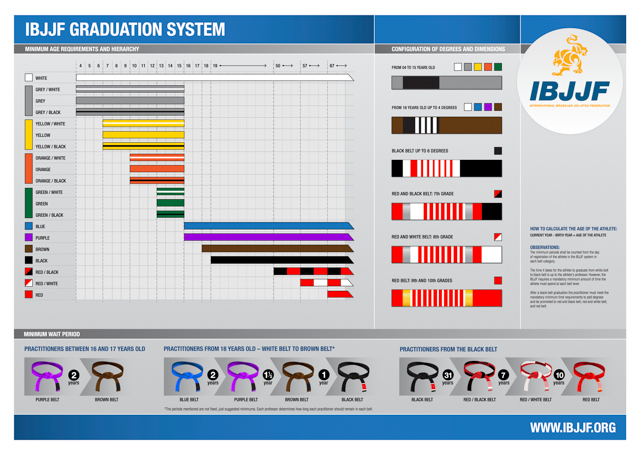 We follow the strict guideline of the IBJJF graduation system. Please see below the list of techniques that a student will demonstrate for their belt exams. On average, 18 to 30 months of training with a minimum of 100 to 120 classes plus passing the following test. Belt promotions are always at the discretion of the head instructor. Factors such as above-average class attendance, natural ability, or competing could possibly shortened the time to blue belt, while a poor attitude, bad temper, or a lack of common morality outside the school could lengthen it. On average, 5 years of training with a minimum of 360 classes plus passing the following test. Belt promotions are always at the discretion of the head instructor. Factors such as above-average class attendance, natural ability, or competing could possibly shortened the time to purple belt, while a poor attitude, bad temper, or a lack of common morality outside the school could lengthen it. On average, 7-8 years of training with a minimum of 750 classes plus passing the following test. Belt promotions are always at the discretion of the head instructor. Factors such as above-average class attendance, natural ability, or competing could possibly shortened the time to brown belt, while a poor attitude, bad temper, or a lack of common morality outside the school could lengthen it. On average, 9-10 years of training plus a demonstration. 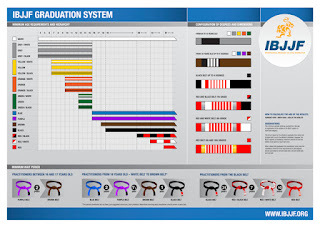 Belt promotions are always at the discretion of the head instructor. Factors such as above-average class attendance, natural ability, or competing could possibly shortened the time to black belt, while a poor attitude, bad temper, or a lack of common morality outside the school could lengthen it.